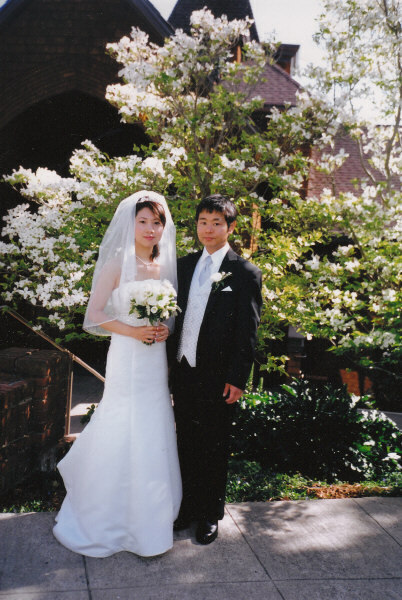 Bride Yoshiko and groom Nobuto traveled from Osaka, Japan arriving in Sausalito the day before their church wedding. They brought with them an elaborate white wedding dress and double veil. Their mothers and aunts wore colorful silk kimono and there was lots of bowing to communicate and show respect. For the ceremony, we used a kneeling bench for the wedding prayers which were performed in Japanese and English. Pastel garden roses and gerberas mixed with lots of candles made the little church on the hill glow. After touring the Bay Area, the couple honeymooned at the Grand Canyon and Las Vegas before returning to their work as travel agents in Japan.